Ordinary, the movie which was the first blockbuster of 2012 had done an extra ordinary business in box office grabbing 15 crores while running unbeaten for 250 years. The tamil version of Ordinary titled as 'Janal Oram' is currently under pre production. 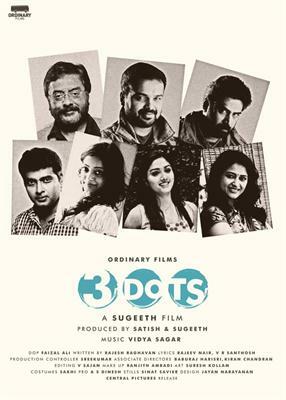 After the grand success of Ordinary, director Sugeeth is up with his second outing '3 Dots' featuring his lucky pair 'Kunchako Boban and Biju Menon along with Pradap Pothen in lead. Kollywood beauty Janani Iyer is casted as the heroine who had been spotted after her majestic appearance in a couple tamil movies. The movie is about the tale of 3 individuals who are jailed for their own deeds. At a particular stage they meet together thus making Vishnu, Louie and Pappan become thick friends. During the while all the three decided to turn good doing in the rest of their life. It was Dr Issac who was primarily responsible for bringing them back to a fresh living atmosphere. But will they turn back to their past life? Rest follows the story of the movie 'Three Dots'. The roles of Vishnu, Louie, Pappen and Dr Issac are enacted by Kunchako Boban, Biju Menon, Prathap Pothen and Narain respectively. 'Three Dots' is packed with all the ingredients which are truly needed for an entertainer. Sugeeth who had been a part of various projects before donning as a sole director do know the real pulse of the viewers and is taking each step with minute care while planning the movie at various stages for the story written by Rajesh Raghavan. This high voltage movie will bring real enthusiasm for the movie fans who are keeping high expectations on Sugeeth just after he announced the project. Other than the leading castes, Krishna Kumar, Niyas Backer, Master Vivaswan, Aishwarya Devan and Sreedanya are casted in the movie who will give life to prominent roles. 3 Dots is being produced by Satheesh and Sugeeth under the banner Ordinary Films'. Faizal Ali will make his presence live by cranking the camera. Vidya Sagar who had given a handful of memorable songs in back on the music table with '3 Dots'. He will tune songs for the lyrics of Rajeev Nair and V R Santhosh. Renjith Ambady would be in charge of the makeup while prominent still photographer Sinat Savier will zoom his camera to take majestic snaps. '3 Dots' will be a visual treat for those who keep their heart vacant for those extra ordinary movies which they could keep close to their heart.